An elegant and easy to make fruit dessert combined with cream. Try other fruits or add a little almond liqueur to make this an adults only dessert or use any other fruit. Cream together the sugar, flour and egg yolks until pale. Pour the milk and vanilla into a saucepan and place on to a medium heat then bring to a simmer. Pour about half of the milk mixture over the eggs whisking constantly then pour back into the saucepan and place back on to a low heat. Stir until the mixture thickens the remove from the heat and allow to cool. Slice the strawberries and toss in the brown sugar. Toast the almond then allow to cool completely. Lightly whip the MEADOWLAND Double. 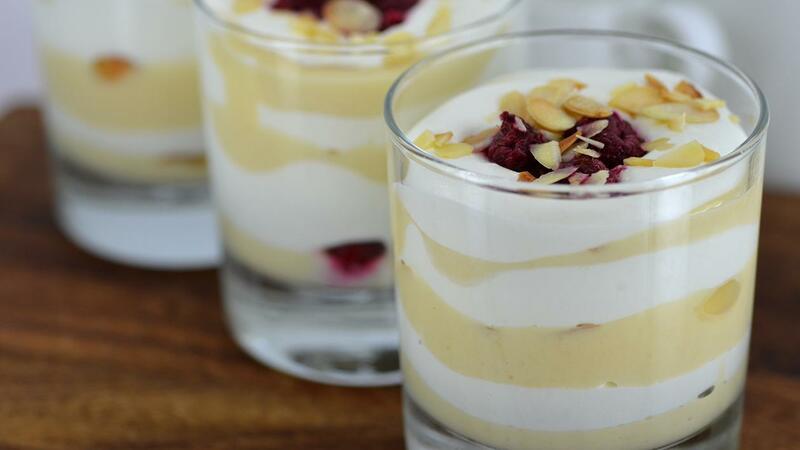 Spoon a thin layer of cream in the bottom of each glass then sprinkle with a few toasted almonds. Add a layer of the whipped cream then top with a layer of strawberries. Repeat the layers until the glasses are full.